Additional glass designs have been added to our Mahogany Collection! Our decorative glasses' distinctive character sets us apart from others as each piece of glass is individually handled by our expert team of artisans and craftsmen. Our fiberglass mahogany doors carries unique detail of real wood door and come in beautiful cherry and chocolate finishes. 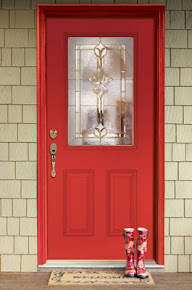 Check out our new exterior door catalogue on our website. Feather River Door's Medina Fanlite Smooth Finish exterior door was used in PBS's Improving Curb Appeal episode to make over a the front of a modest home to improve it's curb appeal. This is how Medina exterior door can look in your home. Doesn't our General look great? You can see the glasses really come to life in the light. We're excited to introduce our Mahogany Exterior Door Collection! Creating a cohesive look through out your home becomes easier with our new Cherry and Chocolate finishes. More details on our new addition at our website - check it out. Feather River Doors will be featured on Fix This Yard on A&E. 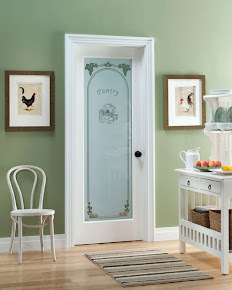 Be sure to check it out for great home improvement ideas and look for our doors as well. :) We'll be posting photos soon! 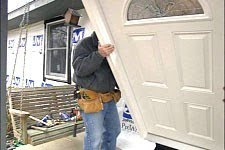 DIY replacement of doors and windows can save you money and green your home in 2010. Due to the Energy Saving Tax, you can get 30% of the cost reimbursed at tax time, up to $1,500. You just have to choose energy efficient equipment that meets standards. However, make sure you do it yourself as the federal government will not reimburse for any of the cost of labor.